You are currently browsing the tag archive for the ‘Luzira Upper Prison’ tag. This week, it was great to see the Guardian publish a long read about the knockout football tournament at Luzira Upper Prison in Uganda. The article’s author, football historian David Goldblatt, argues that football has helped transform Luzira UP from Uganda’s most notorious prison to one in which self-discipline, shared goals, and self-policing shape the friendly culture.. Pain, shame, stagnation are not tolerated at Luzira. It is a prison with fixed but fair sentences (no Life Without Parole) and a mandate to prepare prisoners for release. Don’t get me wrong, it’s no cake-walk but the prisoners’ buy-in to the social structure and how football feeds positive engagement between prisoners and prisoners & staff is exemplary. 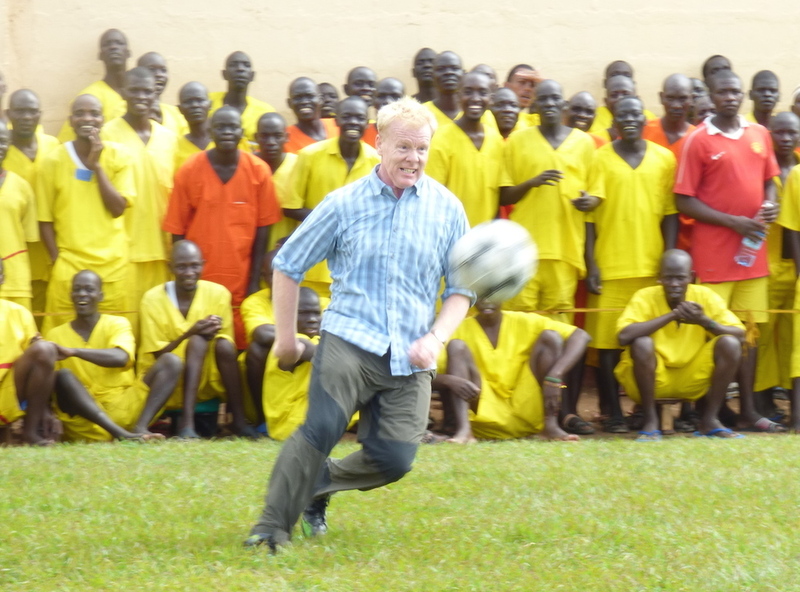 Nigel Boyle playing at Luzira Upper Prison, Uganda, summer 2014. You might recall that 5 month’s ago I published an interview with Nigel Boyle, an Englishman and U.S.-based academic specialising in the economics of global football. He reported witnessing the same community as Goldblatt. Of course, the shocking scandals over at FIFA are a lighting rod for irony right now. We have long known about FIFA’s corruption but the stunning series of arrests of high-profile FIFA leaders — after US Attorney General Loretta Lynch’s years long investigation — comes at a perfect time. When money becomes the driving force, football loses its soul. The Ugandan prisoners playing here for a new jersey and share of a slaughtered goat are the true heart and soul of the sport. All this leads me to ask, who are the real crooks?